CARY - As the holiday season begins, call volume is expected to increase to 2-1-1, North Carolina's free statewide information and referral service that connects people to health and human services and programs in their communities. Now, with a newly enhanced website tool, http://nc.211counts.org, community leaders can see in real-time the needs of callers. 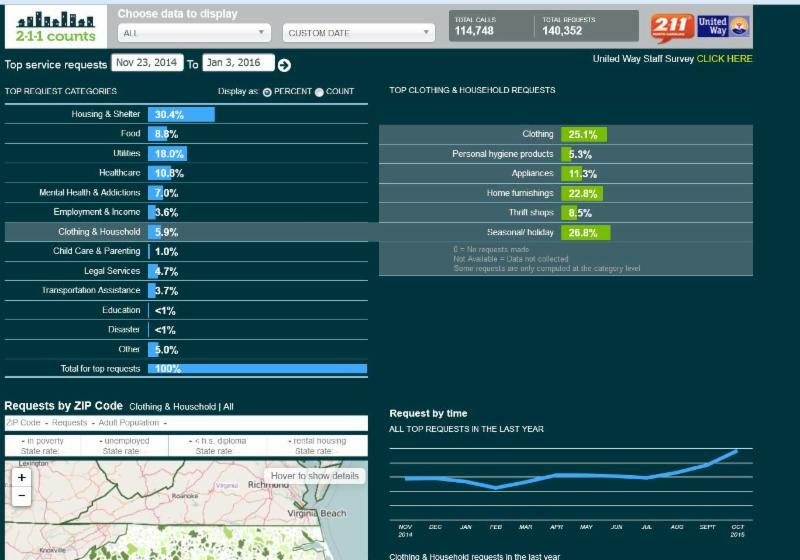 "The recent changes to the 2-1-1 Counts dashboard will allow us to gain even deeper insights on community needs experienced by residents across North Carolina," explained Laura Zink Marx, United Way of North Carolina President. "The creation of the dashboard and the newest enhancements are possible because of the generous support of The William R. Kenan, Jr. Charitable Trust." Last year, between November 23, 2014 and January 2, 2015, top requests from 2-1-1 callers were for mortgage or rent assistance, shelter, utility assistance, health care resources and food, including holiday assistance programs. This year over 145,000 needs have been added to the dashboard. Further details on those calls, and the needs within specific geographic regions, can be found at http://nc.211counts.org. 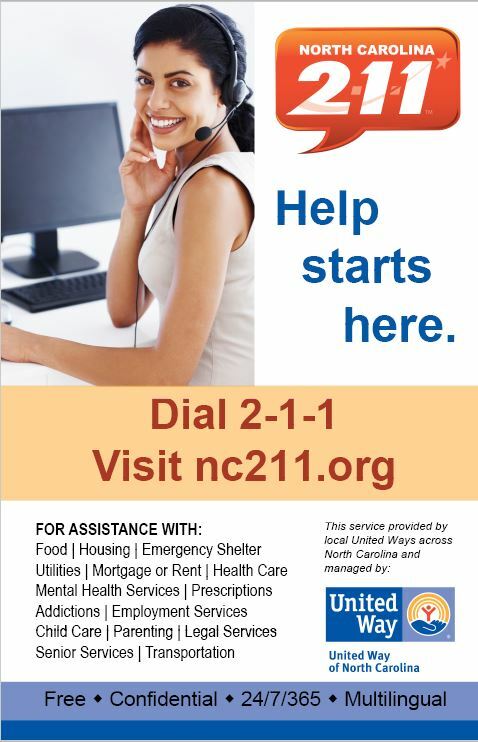 In recent weeks, NC 2-1-1 Counts released new features expanding the level of detail on locations and types of calls received by 2-1-1, the free statewide information and referral helpline. This website provides an interactive dashboard that allows visitors to see information on 2-1-1 calls in their community and across the state. The website is a free, open resource with a growing following. "The ability to see how many people are calling for help with food, shelter, child care and other categories is a huge eye-opener for people who first visit the site," commented Marx. "With this tool, anyone can view local, regional or statewide trends, and community leaders can respond by revisiting next steps. It's particularly useful to community and state leaders, including elected officials, in helping them to make informed decisions. And it's a great resource for nonprofits in demonstrating needs to potential funders," she added. "This time of year, we definitely receive more calls for assistance, and these trends can be seen virtually in real-time on the 2-1-1 Counts website," commented Heather Black, NC 2-1-1 Statewide Strategy Director. "2-1-1 isn't just important during the holiday season, it's a vital community link year-round here in North Carolina. It's also here to help our citizens in the event of a disaster," she explained. 2-1-1 is a free statewide information and referral service that connects people with health and human services and programs in their communities. North Carolina 2-1-1's service is available in all 100 counties. The service is funded by 57 local United Way organizations and operated by United Way of North Carolina through two call centers in Asheville and Durham. NC 2-1-1 also has a website, www.nc211.org , where visitors can browse the resources found in the 2-1-1 database.